"I've always been completely obsessed with drawing. I didn't even particularly want to do it, I just thought it made the most sense, so it kind of chose me in a way." 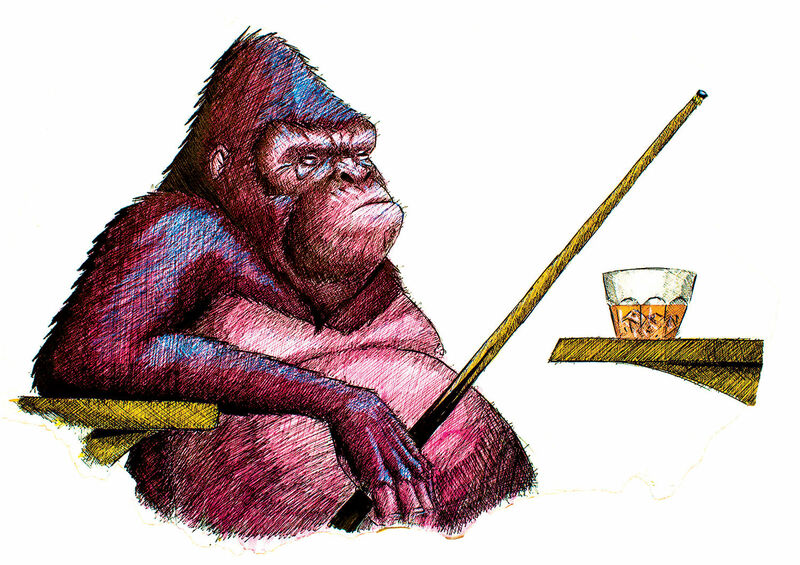 Thomas Moore is an exceptionally talented illustrator of the absurd and slightly obscene side of life. His work captivated my editor and I at this year's Central Saint Martins grad show. 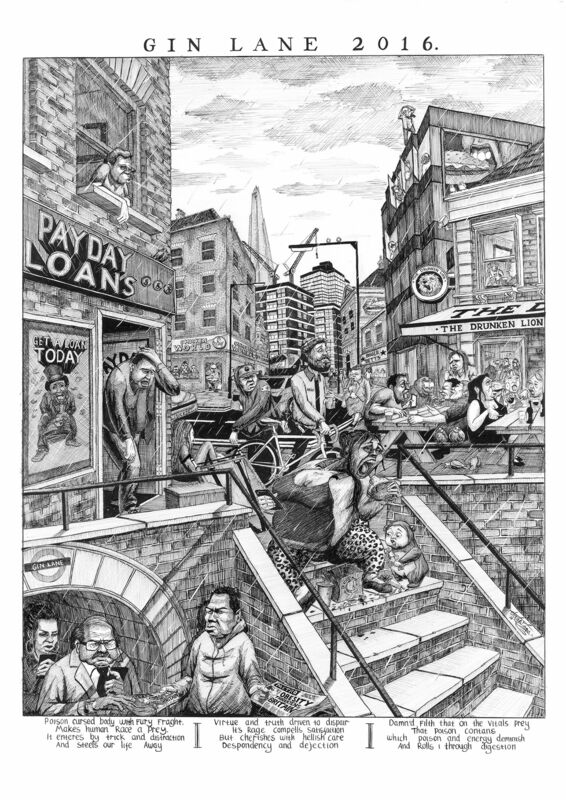 In fact, you also may have already seen it – Thomas was commissioned by the Royal Society for Public Health to reimagine William Hogarth’s classic 1751 cartoon Gin Lane. His final modernisation received plenty of positive coverage in mainstream media, and he deserves every minute of glory. His extremely unglamorous depictions show the more realistic moments of city life in a uniquely grotesque yet humorous manner. This may stem from his background of working a variety of mundane jobs, or the influence of William Hogarth’s satirical comics. Thomas has a talent for exaggerating the outlandish personalities and habits of London, everything from daily tube commuters to fast food eaters. Just mere hours after Thomas packed up his grad show exhibition, I sat down with him to find out what makes him tick, how he refined his style and what his next step is. "When I left school, I didn’t take art too seriously," he tells me. "I did loads of mundane jobs, boring jobs. Working kitchens, in restaurants, waiting, retail, and I really hated it. It got to the point where I thought I needed to do something different." Thomas started pursuing a career in illustration in 2012, when he would take two days off a week to cycle to the library and fill up his sketchbooks. He wanted to build a base; a credible portfolio. "At one point I actually lost my portfolio," he says. "I left it on the bus and I never got it back. It was kind of a liberating thing. I made better work after that." He started off with freelance projects on the side, such as creating graffiti murals (which you can still check out on his Tumblr). He would ask businesses if they wanted a mural, menu or sign illustrated, anything to stimulate his creative mind. But Thomas wasn’t satisfied with just this; he wanted to pursue "intelligent work" and more traditional illustration. After curating a decent portfolio, he thought it was time to head back to study. "I used to doss around in school so much that I never did well in reports, so I thought now that I'm an adult I can see what I can learn. I wanted to see if I could get into the top place, Saint Martins is the top place," he says. "I applied year after year and didn't get in and eventually I got in." Thomas always aspired to be self sufficient with image making. He would feel very strongly about drawing out of his imagination, not just simply tracing a photograph or image from Google. This is how to develop a unique and distinct style, he says. "Nowadays everyone's got a phone, everyone can make an image or take pictures and stuff. I suppose anyone could trace that and change the colours on it too, but not everybody can either draw something they've imagined or draw something they can see. "That way the artist is sort of like a lens or like a filter of reality." Thomas mainly works traditionally now, with pencils and his sketchbook. He draws anything that’s different, interesting or ridiculous. “If I see a funny character I'm going to draw him or her,” he says. Thomas completed a London Underground series, playing up the filthy and dull experience most Londoners face every day to get to work. His illustrations perfectly reflect the internal feelings of frustration, stress and distaste toward the tube. His most recent and favourite series, dubbed Pub Dwellers, is based on the personalities he met while working for a month at a pub in Melbourne, Australia. Thomas describes the place as a "roughneck kind of pub" and notes that previously to his time there infamous thug ‘Chopper’ Read - best known for the 2000 film based on his life starring Eric Bana - used to drink in the venue. "All the characters that used to come in there, they just looked like the biggest characters to me," says Thomas. 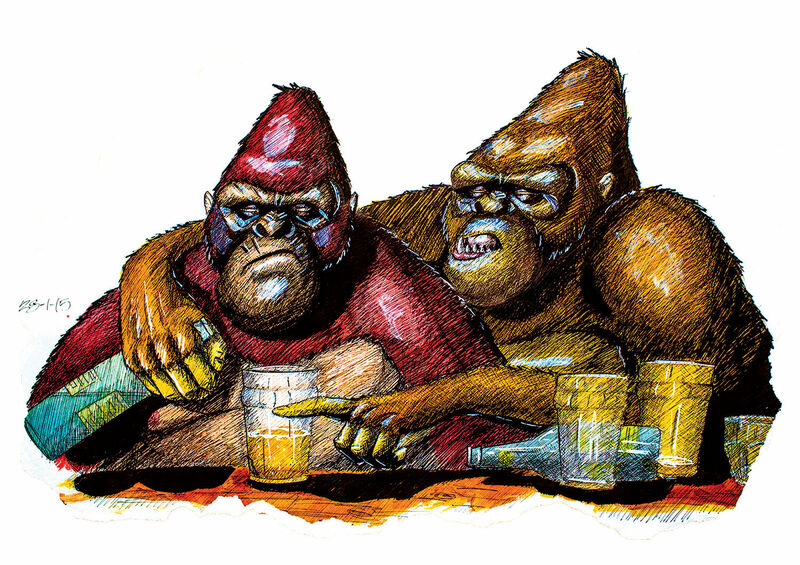 "Some of them looked like gorillas, the way they'd act and behave. I just absolutely loved it. I used to draw them on my lunch breaks. I got to know them all really well," he says. 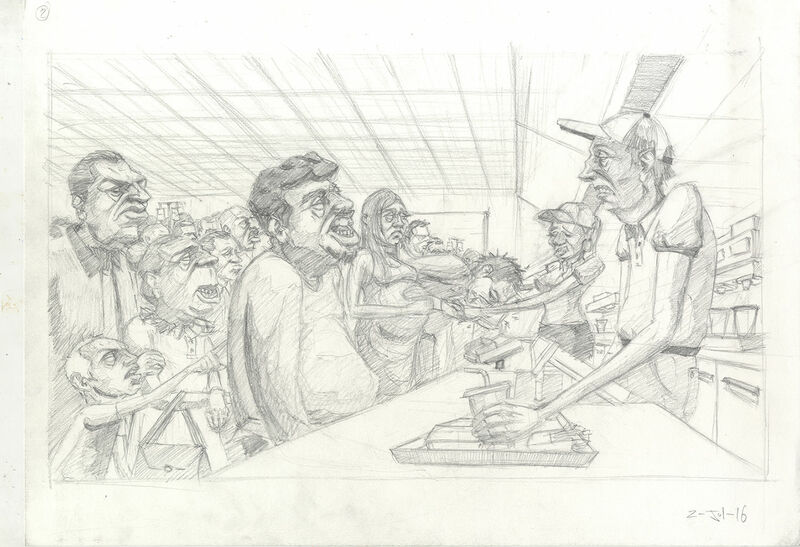 Thomas is inspired by Hogarth’s style as a pictorial satirist, social critic and editorial cartoonist. He most famously pioneered sequential art, or what we know today as cartoons. Thomas studied Hogarth’s work – "the grandfather of cartooning" – that’s why he knew he’d be the perfect fit for the Gin Lane project. 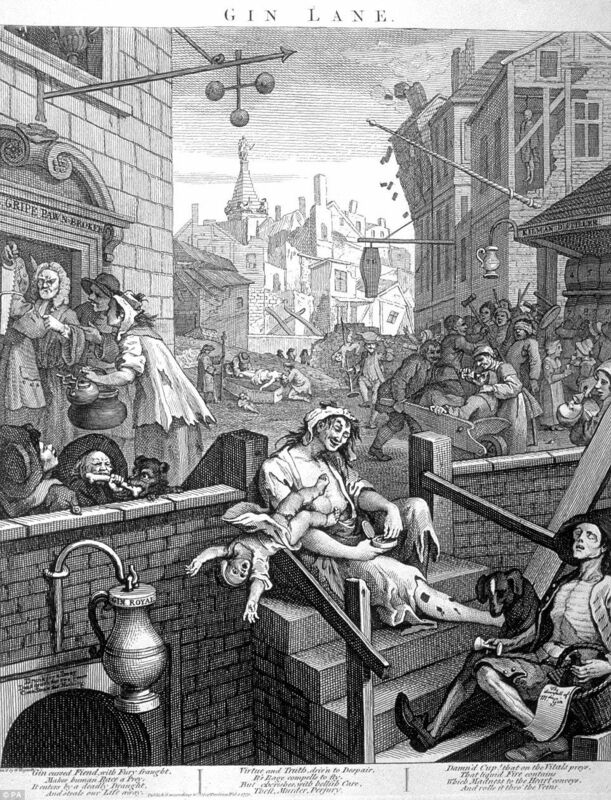 After making a strong case, Thomas won the competition to interpret Hogarth’s original Gin Lane for the Royal Society and Public Health, except Thomas’ illustration would reflect the major public health issues of the UK – obesity and mental illness. Heading out to Gin Lane with his sketchbook, Thomas drew the extremes of these issues. The entire project took him a month and a half. 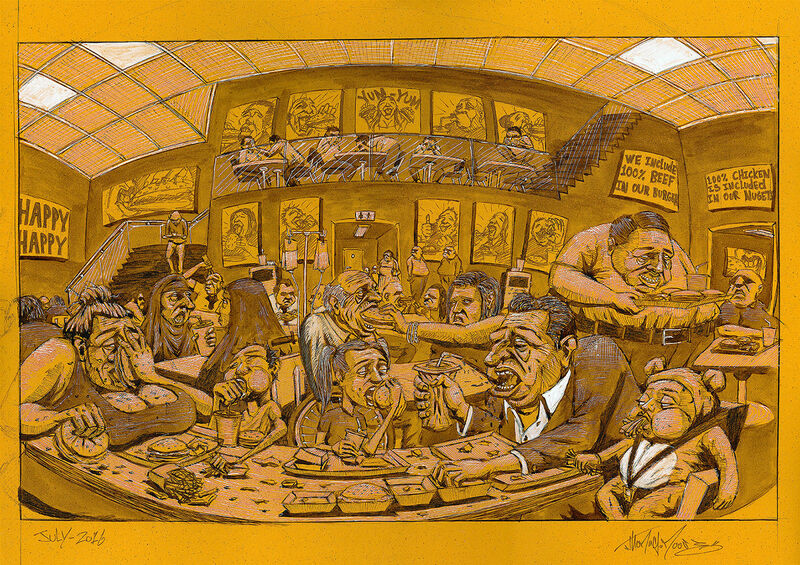 He wanted the illustration to be "instantly recognisable" as a modern version of Hogarth’s – "so when people look at it they know what it is, it's Gin Lane in the future". 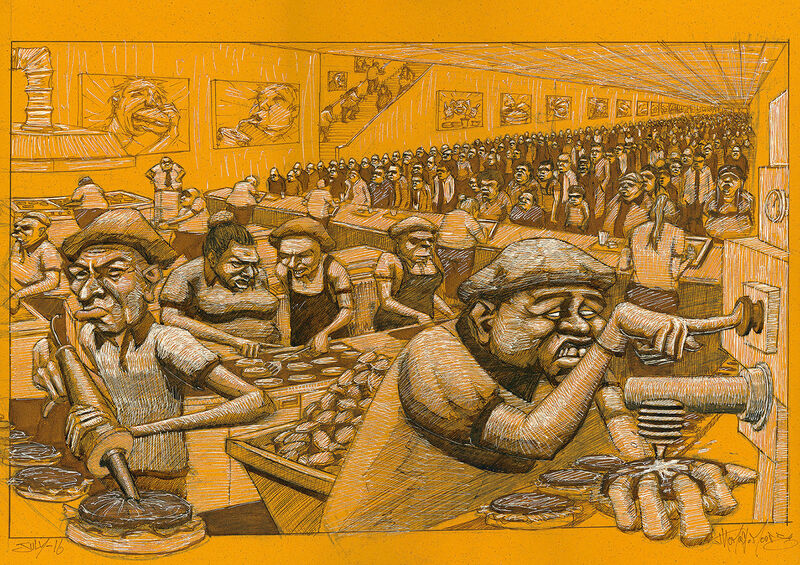 As well as Gin Lane, Pub Dwellers and his London Underground series, Thomas illustrated Fast Food Nation. The harsh nature of his subjects may lead you to believe Thomas is a pessimist. "I think it's a bit of a harsh environment and it's kind of hard not to grotesquely exaggerate those sort of moments. It's just kind of human condition and sort of social commentary," he says. But although his recent series may take on a serious tone (although the ridiculousness is quite hilarious and has a positive effect on people) he promises future work will be "more fun". "If you look at Hogarth he was reflecting the hardships of London. So I was reinterpreting Hogarth and I wanted to one up him and make things worse. But I love this city, I love it, I love London. I love the characters, and capturing characters is kind of what I specialise in." He says he was given nearly complete creative freedom with Gin Lane, and the illustration stands entirely as his interpretation. "They're the projects I look for, ones that give me freedom. I prefer to have as much as freedom as I can. You have to do commercial work to keep the money coming in. But the more I follow that, the more I'm going to have a portfolio full of stuff that I don't want." Rough sketching and coming up with ideas is what Thomas enjoys most. As soon as he gets an idea he’ll scribble it onto the page of his sketchbook to see if it will work or not. "Then from there, when I start to become more certain I'll try to embark on the final piece and sketch things out. Get out the ink and make a finished piece. Yeah, it always starts from my sketchbook." 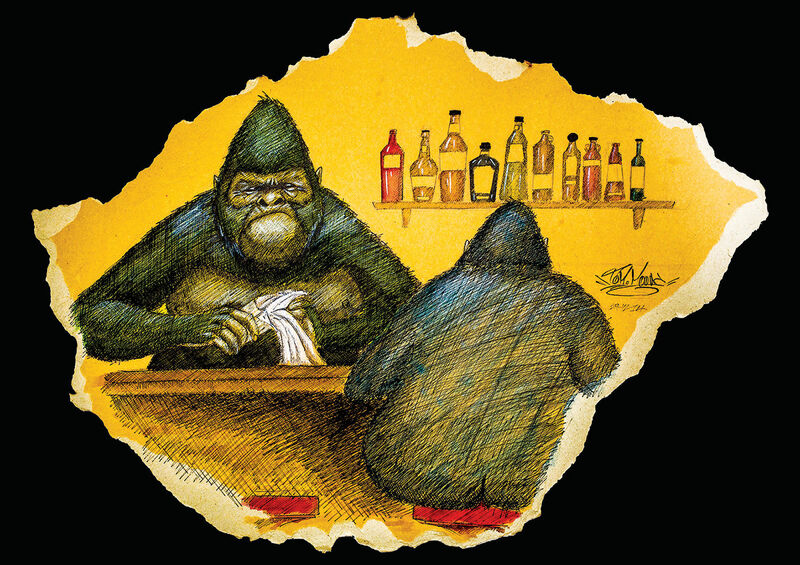 At the moment he’s enjoying using watercolours, which made an appearance in his Pub Dwellers series. He usually works in black and white with his pens or pencils. "I think that will always be my weapon of choice." A few commissions and projects are on the go for the freelance illustrator, but now that he’s free from the woes of university, travel in Canada is on the horizon. "It has got beautiful nature, it's got some cities that are slightly less intense. "I need some nature in my life. I need fresh."